What was the Battle of Okehazama? "On the outskirts of Nagoya City, 2,500 samurai trounced an army of 35,000 in what became known as the Battle of Okehazama. It was one of Oda Nobunaga’s finest victories, defeating a fierce adversary at odds of twelve to one! Visiting the battle site is a great way to soak up Japanese history, particularly as this was one of the important turning points in Japanese history. The site of the actual battle and the surrounding walking route tracing the Oda soldiers’ approach to the battlefield is a little difficult to find, more so as the “official” battle site and memorials are in the wrong place! (Please note, The Japan Tourist map shows the actual battle site) First of all though, here’s a rundown of the battle. Imagawa Yoshimoto, (1519-1560) a powerful warlord, based in what is now Shizuoka Prefecture, had become powerful enough to make an attempt on the capital, Kyoto. To do so required steamrolling across the provinces, one of which was held by the Oda clan under the rule of it’s violent and charismatic leader, Oda Nobunaga. Imagawa took the vitally important Tokaido main artery route, entering Nobunaga’s territory early June 1560, with an army estimated to have been about 35,000 and camped just outside of modern day Nagoya in an area known as Dengaku-hazama, near the village of Okehazama. Nobunaga, on the other hand could only raise 2,500. He had left his castle at Kiyosu and traveled via the Atsuta Shrine where he prayed for victory before arriving at the Zenshoji, a fortress like temple overlooking the Imagawa forces camp site. Nobunaga ordered his men to set up war flags and banners around the Zenshoji to make it look as though there was a much larger army in residence. Undercover of some rainstorms he left the safety of the Zenshoji and made his way closer to the enemy. June 22 1560 was a steaming hot day, interspersed with showers and thunderstorms. That’s when Nobunaga made his move. The Imagawa forces were celebrating their recent victories over a number of smaller Oda held castles with sake and food. The smaller number of Oda troops, familiar with their home territory turf, made their way down from the slopes and hills above Dengaku-hazama, and using the thunderstorm to mask their movements, entered the small valley and struck hard at the heart of the Imagawa camp..
Imagawa Yoshimoto was in his tent like war camp enclosure when he heard the first of the fighting. Thinking it was a drunken brawl amongst his closest men, he left the camp to investigate, and was surprised to see Oda troops bearing down on him. Imagawa fought off one attack by a spear wielding Oda samurai, cutting through the spear thrust at him, and into the man’s leg. He was then tackled by a second Oda samurai, who promptly took his head. Imagawa Yoshimoto was just 41 years old. The battle raged for a short while afterwards, but with their leader having been dispatched early, and all bar two of the senior officers killed, the remaining officers and men surrendered, and joined the Oda faction. Nobunaga’s 2,500 troops had defeated an army of 35,000! The battlefield is now a park, with a recently unveiled statue of Oda Nobunaga and Imagawa Yoshimoto near where Imagawa is believed to have fallen. Much of the area has been overtaken by houses and a local supermarket shopping center. The Oda route is well signposted in Japanese and English and can be easily followed providing a better understanding and appreciation of the battle. Other signposts also point out related historical spots to visit, including the head mound, where enemy heads were mass buried, the Chofukuji Temple, where many more heads were interred, and the area where the battles were launched and fought. The battle signified the end of the Imagawa clan, while Nobunaga went on to almost rule the nation before being assassinated in 1582. Every June events are held in the otherwise quiet hamlet of Okehazama to commemorate the battle fought between Oda Nobunaga and Imagawa Yoshimoto at odds of twelve to one. " 1) In black and white in Ukiyo-e Masterpieces in European Collections: Musées Royaux d'Art et d'Histoire, Brussels, vol. 9, Kodansha, 1989, p. 205, #131. 2) In Catalogue of Japanese Art in the Náprstek Museum published by The International Research Center for Japanese Studies: Nichibunken Japanese Studies Series 4, 1994, p. 142. 3) In a black and white reproduction of this image in "Historical Eras in Ukiyo-e" by Richard Lane in Ukiyo-e Studies and Pleasures, Society for Japanese Arts and Crafts, the Hague, 1978, #47, p. 49. Lane notes that their were two printings of this print. One in 1822 and another four years later in 1826. 4) In color in 原色浮世絵大百科事典 (Genshoku Ukiyoe Daihyakka Jiten), vol. 9, p. 106. 5) In color Ukiyoe Museums in Japan (Nihon no ukiyoe bijutsukan - 日本の浮世絵美術館), vol. 5, p. 148. This example is from the collection of the Ikeda Bunko Library. 6) In a full-page, black and white reproduction in The Art of Japanese Prints by Richard Illing, 1980, p. 144. 8) In color in Schätze der Kamigata: Japanische Farbholzschnitte aus Osaka 1780-1880, MNHA (Musée national d'histoire et d'art Luxembourg), p. 36, #46. 9) In color in Ikeda bunko, Kamigata yakusha-e shūsei, vol. 1, 1997, #166, p. 61. (This example is dated 1826.) This image is used on the cover of volume 1 of this multi-volume set. The career of the great bandit-hero, Ishikawa Goemon, was one of the standbys of the kabuki theater, and his figure appears in countless woodblock prints. In this scene, Goemon wears the robes of an Imperial Messenger, which he has stolen as a disguise to enter the palace of the warlord Hisayoshi. Goemon intends to murder Hisayoshi to avenge his own father's death, but is surrounded by his enemy's henchmen. He escapes by magic and continues his adventures. Hokushū's print, which may have been originally issued together with a series of bust portraits, was certainly reissued for a performance of a related play in 7/1826. In this play Goemon disguises himself as an Imperial Messenger to steal the Imperial Seal, which is necessary to his ambition of ruling Japan. At the crucial moment he is met and foiled by Konoshita Tōkichi, another name of his enemy Hisayoshi. The encounter is shown in an undivided chūban diptych by Shunshi one of the earliest Osaka prints in this format. Illustrated in Roger and Keiko Keyes The Theatrical Work of Osaka Prints pp. 84-85. 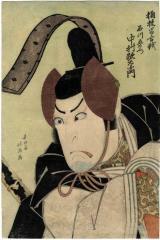 Keyes noted that this image of Utaemon III as Goemon in the play Kinmon Gosan no Kiri was to commemorate a production of 2/1822. It was reissued for a performance of Konoshitage Hazama Gassen in 1826. There is another copy of this print in Nationaal Museum van Wereldculturen, Leiden.